I like the sepia feel to this shot! Me Too! Is it something you did, Jilly, or just the light on a town built of old stones and sea shells? Thank you William and Karen. Yes I fiddled around in Lightroom and simply used an effect called 'Aged Photo' - I don't often like these effects but it seemed to suit the photo. Afterwards I simply dimmed the brightness a little and added a tiny bit of contrast. The child was having a wonderful time, riding around and around the fountain, in and out of the restaurant and never noticed me. The washed-out color works well. 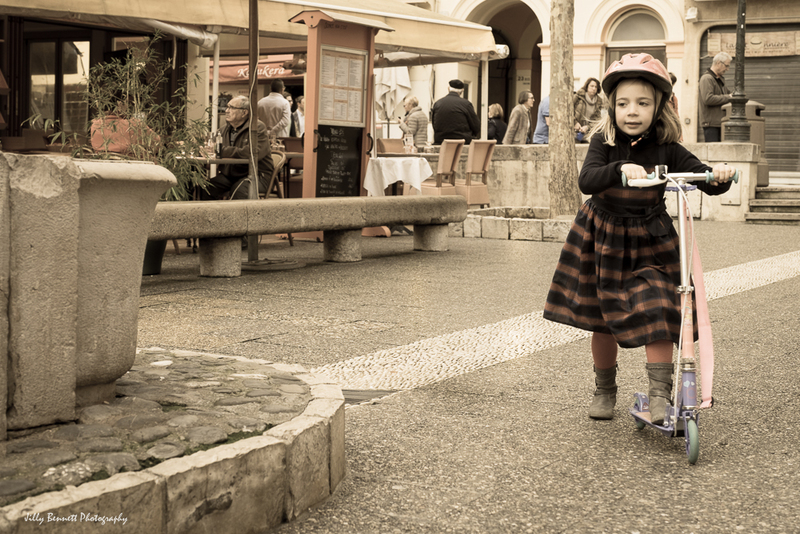 Glad French children are learning to wear helmets. I noticed that, too, Bob. I thought helmets were an American thing but there it is in a small, French town.